According to a recent summary, Titanosauria comprise 35 species, which represent 29% of the 121 sauropod species and 5% of the 661 dinosaur species (tabulated from Upchurch et al., 2004). 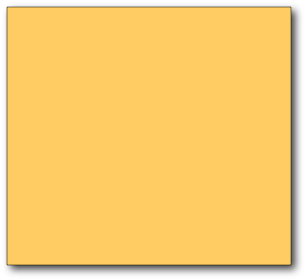 This tally is augmented to 41 species with the inclusion of newly named titanosaur species, reinstatement of species considered by most to be members of that group (Nemegtosaurus mongoliensis, Quaesitosaurus orientalis, Mongolosaurus haplodon; Wilson, 2005), and exclusion of invalid species (e.g., Titanosaurus indicus Wilson and Upchurch, 2003). According to this revised estimate, titanosaur species represent 34% of sauropod species and 6% of dinosaur species. Although most titanosaur species come from southern landmasses (26 species), many are known from northern landmasses (15 species). The summary above shows the distribution of titanosaur body fossils, which first appear in the Late Jurassic and are found on nearly all continental landmasses during the Early Cretaceous. We infer that titanosaurs actually originated prior to the Middle Jurassic, when the “wide-gauge” trackways attributed to the group first appear (Wilson & Carrano 1999). Thus far, no sauropods are known from Antarctica – but we expect that they were there as early as the Middle Jurassic, based on the distribution of other sauropods on neighboring landmasses (Wilson 2005). We also expect that titanosaurs were present on Antarctica during the Late Cretaceous, based on their distribution on southern landmasses during that time. These data were last updated in May 2006; please contact us with any corrections or additions. Sauropod species (blue) and titanosaur species (yellow) named each five years since the first was named in 1841. Data from Upchurch et al. (2004) are complete until 2001; sauropod and titanosaur species tallies shown for 2000-2005 are estimates. 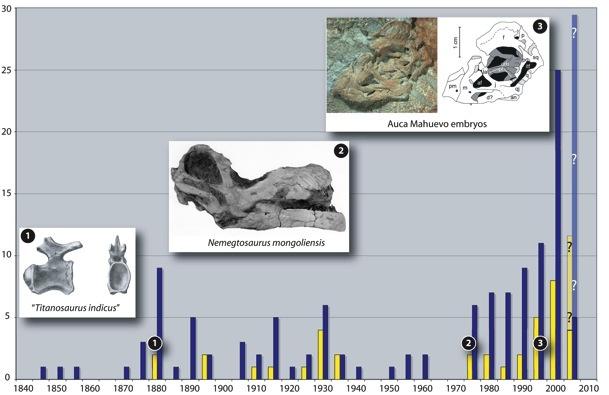 Images 1-3 indicate milestones in titanosaur studies: first species (Falconer 1868), first skull (Nowinski 1971), and first embryonic remains (Chiappe et al. 1998).